Well, after months of deliberation, I did it. I got bippity-boppitied. I realize that sounds faintly salacious, but if you have been journeying with me, you’ll know that it is kind of the opposite of salacious. If you haven’t been reading along, you might want to check out http://www.terrilabonte.com/2018/08/bippity-bop-or-not/ and http://www.terrilabonte.com/2018/09/bopworthy/. My pixie posse and I set off to the Grand Floridian Resort, ready for a glitterific adventure. My friends were going to watch while I transformed into Tinker Bell right before their very eyes. After my tinkifying, we planned to monorail our way over to the Magic Kingdom to visit the Princess of Pixie Hollow herself, then have a nice lunch. When we pulled into the parking lot at the Grand Floridian, we knew we were in for a good day. We encountered the Cinderella pumpkin wedding carriage, with its six white horses, carrying a beautiful Disney bride towards the wedding chapel. Sparkle alert, already! How can that not be a great omen? 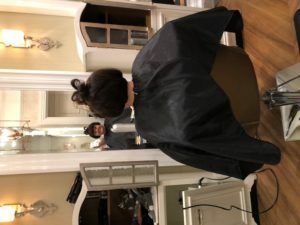 When we entered the salon, I felt my blood pressure rise a bit. I bleed sparkle and I think my circulatory system was leaping in joy from all the glitter in the atmosphere. My giddiness level increased. I was excited from the top of my short, flat brunette hair to the white pom poms on my green fairy slippers. For someone who struggled so long and hard about whether or not this bippity-boppetying was a good idea, I was all in. I’m not sure how I managed to sit still and not flitter fly all over the salon. Andrea was my own personal Purveyor of Pixie Dust. 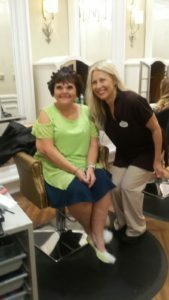 She was sparkling so much, she didn’t need a magic wand to complete my makeover! She made me feel special and magical and adorable every minute I was with her. What is even more interesting is that she made me feel like she was having every bit as good a time as I was having. I mean, I realize this is her job and she wasn’t making me a Tinker Bell twin for the sheer fun of it. Still, she certainly acted like having me as a client absolutely made her day. I think I am, by and large, a pretty pleasant person, but I can’t think that there is anything that special about me to inspire such delight. Maybe we were all smoking the pixie dust! Andrea started with my hair. I was concerned because my hair is pretty short and I couldn’t imagine a Tinker Bell makeover without the Tinker topknot. Andrea brushed aside my worries. All she needed was faith, trust, and pixie dust. However, Andrea didn’t stop with the bun. 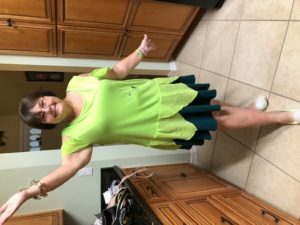 She had an idea that I could look like Tinker Bell, but with some special Terri pizzazz. Using lots and lots of hairspray, she changed my hair to sculpting material. I ended up with my topknot, but also with curls and tiny Tinker Bell bows all over my head. I can’t even explain all the interesting special effects Andrea crafted from my hair. I said I looked like a combination of Tinker Bell, Cindy Lou Who, and myself. I know such an odd mutation is hard to picture (which is why I am including photos), but trust me when I say it was very effective and fetching. It was exactly what I wanted, but didn’t know it. The final step for my hair was a liberal dusting of glittering pixie dust. For those of you who know the whole Tinker legend, you’ll understand that I was very pleased to see that the sparkle was BLUE pixie dust. For those of you who don’t understand the implication, you can go watch the movie Tinker Bell and The Lost Treasure. Let’s just say that, without blue pixie dust, the world would be a very different place! Or at least my world would. After the hair came make-up. Andrea turned me away from the mirror, so I could not see what was happening. My pixie posse watched, fascinated, cell phone cameras in hand, as I squirmed in anticipation. They cheered me on, but I wondered if they were just being nice. I heard them cooing all kinds of amazed noises, but “amazed” can be good or bad. People coming to the salon to ask questions, make appointments, or check in for their own treatments stared at me. I kind of stopped conversation. There was one lady at the counter who was so transfixed by what was happening on my face, the receptionist had to keep asking the same questions over and over again before she answered. There was one debate during the make-up process. 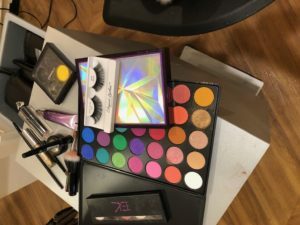 Should I have false eyelashes or not? Before coming to the salon, I thought I would skip the eyelashes. I thought they might be a bit over the top (yes, apparently I did think there was such a thing as “over the top” when having a Tinker Bell makeover) and, for some reason, they kind of read “villain” to me. Andrea also seemed to be on the “no eyelash” side of the aisle, as she thought the lashes they had were pretty extreme. However, my pixie posse believed that I might as well do the eyelashes. One pixie partner said they would look good in the pictures. Another reminded me that I probably wasn’t ever going to do this experience again so I should just go the full Monty, as it were. The girl staring at me at the reception desk was also on Team Eyelash. She kept mouthing, “do the lashes” at me. I finally succumbed to peer pressure and I am very glad I did. Andrea found some mid-length lashes for me, which were plenty long enough, believe me. In fact, when I put my glasses on much later in the day, the lashes were pushing them down my nose. I never knew I had such big eyes. 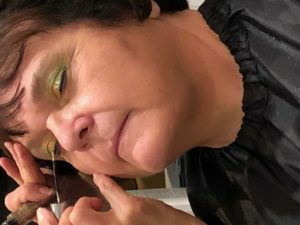 Andrea was able to fit at least four colors on my eyelids. All of the colors sparkled, of course. She picked from a huge palette of eye shadow colors, all of which were brighter than anything ever witnessed in nature. Of course, the highlight of my lids was the sparkly Tinker green that might as well have my name on it from this day forward. When Andrea turned me around, I couldn’t believe my eyes. I was amazed…. In the best possible way. I have never, ever looked that good. Yes, I looked like I belonged in Pixie Hollow. Yes, I looked like I was Tink-inspired. But I also looked like some version of me… a me completely liberated from expectations, care, and responsibility. It was like I was channeling Tinker Bell, as well as looking like her. Yet, I was still very clearly myself. 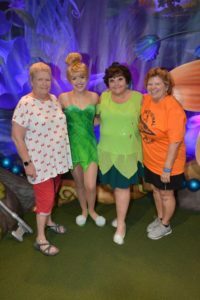 When we went to visit the original Tinker Bell at the Magic Kingdom, she and I had a wonderful pixie meet-up. 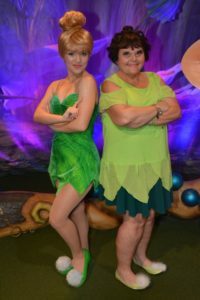 I’ve been to see Tinker Bell many times in my life, but I believe we bonded in a new way on the day of my tinkification. Part of me is still with her in Pixie Hollow. My friends and I took pictures with Tink. We enjoyed being childlike, living in the magic. I loved having this experience. I loved having my friends with me. I can’t imagine doing it without my pixie posse. They encouraged me to immerse myself in the experience and celebrate. We celebrated together. We celebrated our lives, our love of Disney, and friendship. These are some wonderful things to celebrate. When I went home that night, my heart was still smiling. When I removed the remnants of Tinker Bell, I was a little bit sad… but not too much. 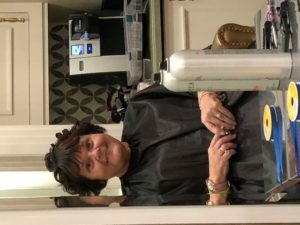 Even without the make-up, I still had the pixie dust… on my scalp, on the floor of my bathroom, and, most importantly… in my spirit! Thanks to Andrea, my pixie duster, for Tinkifying me in a way I never expected. Thanks to my wonderful pixie posse partners, Nancy and Kathy, for being my fairy godmothers. The finished product- my Pixie Sister and me! So what do you think of the new me? Do I look like I belong in Pixie Hollow? Should I just grow up? Please share your perspective by leaving a comment. In the alternative, you can email me at terriretirement@gmail.com. It was so cool, Bonnie! I’m so glad I did it! This is just great! Wow, you did it. how cute you looked too….Thanks for sending the pictures. I think that you should play as long as you can….you are still sooooooo young….20 years younger than I am. Enjoy and have fun now! I love you, too, Lois! I don’t think I really played as much as I should have when I was a little girl so I guess I’m making up for lost time!